The following pages are focused on the use of well logs to build sequences stratigraphic models of depositional systems. For this process well logs are primarily used to establish the grain size and the lithology of the penetrated sediment. The best sequence stratigraphic models of the sedimentary fill of basins are provided by a combination of seismic data, well logs and cores and outcrop studies in conjunction with biostratigraphy. 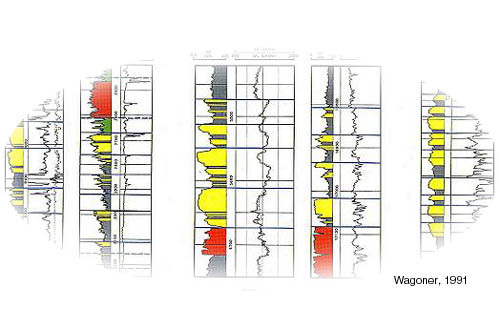 The cores and well logs and outcrop studies provide access to a detailed vertical resolution of sedimentary sections while seismic and outcrop studies provide the lateral continuity to the sequence stratigraphic framework and the biostratigraphy provides the time constraints. All these different sequence stratigraphic techniques can be used independently of each other to produce accurate interpretations of the depositional histories of the sedimentary fill of a basin but the best models come from a mix of all three. The character of electric logs of wells that penetrate clastics often reflect changes in grains size and so are easier to use in this process, while the logs of wells that penetrate carbonates often should be calibrated with cores, since carbonates are more susceptible to diagenesis and their change in character may be affected by more than changes in grain size. The sections that follow initally focus on the well log response to shallow water clastics and then move on to their response to shallow water carbonates. At the start of an interpretation of sequence stratigraphy using well logs one must first identify the predominant of sequence stratigraphic surfaces. The MOST important of these surfaces, and the FIRST that should be identified when using logs, are maximum flooding surfaces (mfs) and transgressive surfaces (TS). These coincide and are correlated with radioactive shales (use of the gamma log) that are interpreted to have been deposited across relatively flat surfaces. 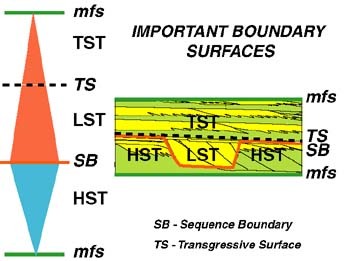 Once the mfs and TS are established and tied, then the sequence boundaries (SB) of both carbonate and clastic sedimentary systems are identified. These will tend to lie directly beneath the sand sized sediment fill of depressions on eroded and incised surfaces and over the prograding clinoforms of high stand systems tracts (HST). In both clastics and carbonates the second and often co-incident step in the interpretation of well logs and cores is the use of parasequence stacking patterns (the vertical occurrence of repeated cycles of coarsening or fining upwards sediment) of to identify the lowstand systems tracts (LST), parasequence cyclic stacking patterns are commonly identified on the basis of variations in grain size and when these fine upwards are indicated by triangles whose apex is up while those that coarsen upwards are indicated by inverted triangles whose apex is down. The example presented in the above diagram catches the essence of the response of shallow water clastics responding to a fall and rise in base level and the incision and fill of the shelf margin during this cycle. cyclic fill of incised depressions that tend to fine upward. cyclic sand to shale bodies of basin floor fans that tend to fine and thin upward. cyclic sand to shale bodies of shelf margin clinoforms that tend to coarsen and thicken upward. Regressive cyclic shale to sand bodies of that tend to coarsen and thin upward. You are advised to link to the exercises and movies on the clastic well logs of the Guarico basin on this site to learn more about these techniques. The above examples are focused on near shore shelf clastics. The same approach should be taken for carbonates, with the second co-incident step in the interpretation of carbonate well logs and cores being to identify parasequence stacking patterns (the vertical occurrence of repeated cycles of coarsening or fining upwards sediment) of to identify the lowstand systems tracts (LST), transgressive systems tracts (TST) and highstand systems tracts (HST) that are enveloped by the mfs, TS and SB. As in clastics, carbonate parasequence and cycle stacking patterns are commonly identified on the basis of variations in grain size and when these fine upwards are indicated by triangles whose apex is up while those that coarsen upwards are indicated by inverted triangles whose apex is down. For more information on this topic you should click here to link to the carbonate sequence stratrigraphy page of this site. Interpretations that use well logs for sequence stratigraphy should be tied to biostratigraphy so they can be used to correlate and analyze sedimentary rocks from the perspective of geologic time. Well logs lend themselves to the detailed reconstructions of paleogeography and the generation of high frequency stratigraphic models that predict the distribution of sedimentary facies, particularly those associated with aquifers, sediment bound ore bodies, and hydrocarbon reservoirs, their source rocks and seals.